The Lockheed Martin Mars Experience Bus is part of the Generation Beyond program. 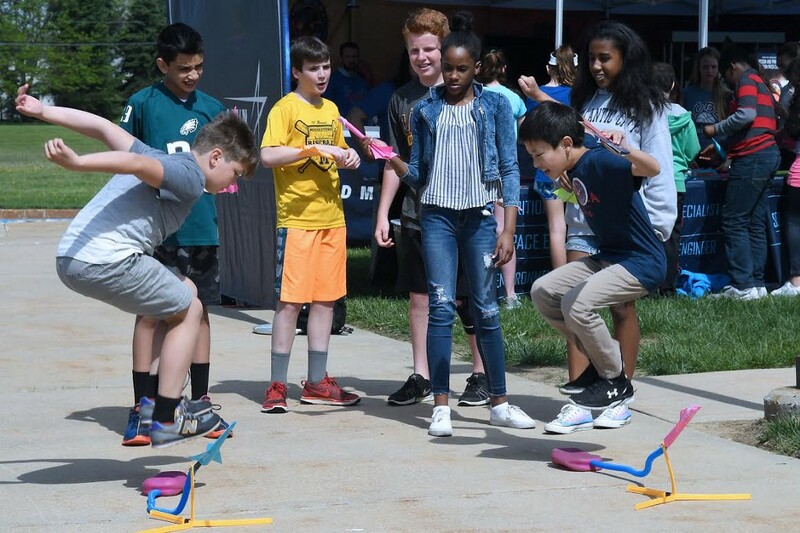 Moorestown Upper Elementary School sixth graders have fun with paper stomp rockets as part of Lockheed Martin’s Generation Beyond Program at UES last week. Photo special to The Sun. 2030 might seem a long way away, but NASA is already planning a mission to Mars and is hoping now-sixth graders will take the trip. To help inspire students, Lockheed Martin has created the Mars Experience Bus — a “one-of-a-kind virtual reality experience” built into a school bus. The Mars Bus, designed to help students believe in their potential and inspire them to reach higher, visited the Moorestown Upper Elementary School last week to give sixth graders the opportunity to learn about space and experience what it may be like to visit Mars one day. The virtual reality platform replicates 200 square miles of the Martian surface and is the first immersive virtual reality vehicle ever built that replicates the Martian landscape. When Moorestown Township Public Schools science supervisor Gavin Quinn found out about the Mars Experience Bus, it was an opportunity he couldn’t pass up. Economists project there could be 2.4 million unfilled STEM jobs by next year, which is why it’s important to motivate youth to explore science and engineering careers if NASA is going to make it to Mars in less than 15 years, according to Lockheed Martin. To create the Mars Experience Bus, all of the windows in the school bus were replaced with LED screens. The countdown til takeoff begins, and the bus starts to shake. After a quick trip through space, the bus lands on Mars and the screens show the Martian landscape from all angles. After a tour and a message from an astronaut, the trip is over. Lockheed Martin spokesperson Greg Lester says when he rode on the Mars Bus for the first time, he was pleasantly surprised to see how interested the students were. Colacot, who visited Moorestown Upper Elementary School with the Mars Bus, agreed, saying the students were thrilled. In addition to the Mars Experience Bus, Moorestown Upper Elementary School students participated in other stations including a paper stomp rocket craft and a sticker station to make astronaut patches. To supplement the Mars Experience Bus and to help NASA reach its goal, there are lesson plans, activities and other resources to provide students with more information and understanding about space, Earth and how they relate. “They should be excited that they can be part of something like this,” Manu said.